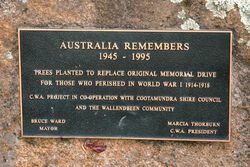 Trees were planted in 1995 as part of "Australia Remembers " to replace the original Memorial Drive that commemorated those who died in service or were killed in action during World War One. The original trees were planted in George Street on the 1st September 1917. The planting of Honor avenues has been taken up enthusiastically at Wallendbeen, especially by the Progress Association, backed up by the Municipal Council, and the townspeople; as a result of which the first planting of trees in memory of 23 soldiers took place last Saturday, when, despite the unfavorable weather, a large crowd of workers were in attendance, digging holes, planting, and erecting tree guards. etc. The trees last Saturday were all planted in George street, near the new railway station and the planting of Queen street being postponed until Wednesday. Mr. Andrew Bolder, the President of the Wallendbeen Progress Association welcomed the visitors and asked all to sing the National Anthem. He then thanked those present for their very kind assistance and cooperation in the matter of making the honor avenues and especially the Council for assistance and sympathy, for they gave the Progress Association a free hand in arranging the avenues. He called upon the hon. secretary, Mr. J. E. Gormly, to explain the details of the scheme. 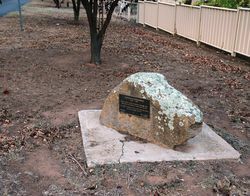 Mr. Gormly impressed on those present that the Progress Association did not intend to rest until a tree was planted for each individual soldier who had left the district to fight for our country. The function would be made an annual affair, but this year people were asked not to be offended if the avenue did not include trees for some of our absent heroes. Next year the avenues would be brought up to date, and every soldier would be represented. Friends were asked to help to make the affair complete, and see that no soldier was omitted from the list. At Mr. Bolger's request the Mayor (Alderman Holt) dedicated the Honor avenue in George street, to our absent soldiers from the district. He had great pleasure in doing so, and it was doing honor to our noble soldiers and at the same time it was the foundation of what would be later on a beautiful and permanent ornament to the town. He expected that the Progress Association would be a great help to the district. Young Witness (NSW), 7 September 1917.